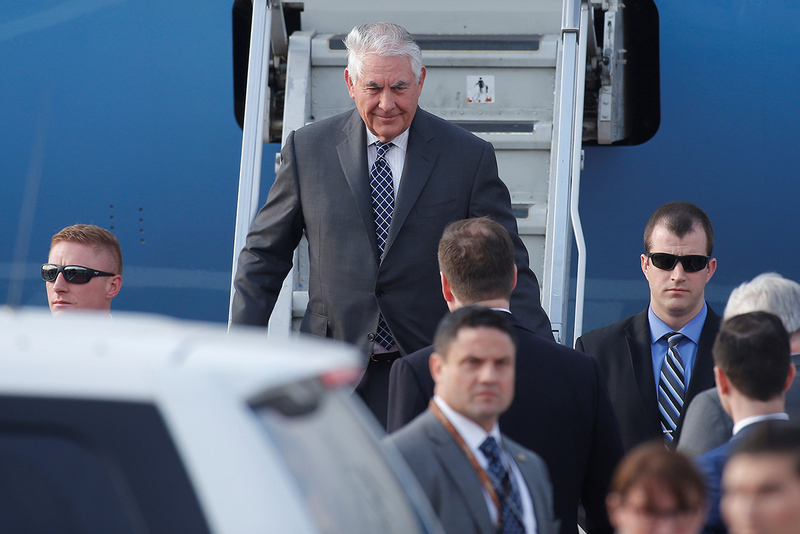 U.S. Secretary of State Rex Tillerson disembarks from a plane upon his arrival at Vnukovo International Airport in Moscow, Russia April 11, 2017. Russian President Vladimir Putin has received U.S. Secretary of State Rex Tillerson and Russian Foreign Minister Sergey Lavrov in the Kremlin after they concluded talks, presidential spokesman Dmitry Peskov said. "Russia’s President Vladimir Putin is receiving U.S. Secretary of State Tillerson and Russian Foreign Minister Lavrov in the Kremlin," he said without providing details. Earlier on April 12, Peskov said that Putin could receive the Russian foreign minister and the U.S. secretary of they considered it reasonable to brief the president on the outcome of their talks. Read more: Russia hopes to understand prospects of dialogue with U.S.